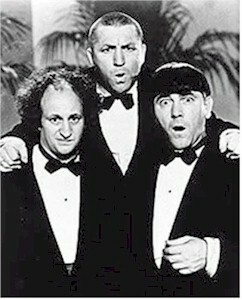 So, what did you guys think of last year's Farrelly brothers "Three Stooges" film? I watched it on DVD today, and although I had expected to give up on it after a few minutes, I wound up watching the whole thing, and found it pretty entertaining. Sean Hayes even sounds like Larry Fine. I used to speed home to watch them on TV. If it wasn't Curly, I did my home work. Without him, they just didn't have "IT"!!!!! The lovable and irrepressible Curly was the key to their success. Without Curly I wouldn't have cared. Along with Laurel & Hardy and Abbott & Costello..